During a typical oil change, tight engine compartments can prove challenging to navigate, risking burns and other types of injuries for workers as they attempt to maneuver tools into narrow spaces. Oil change valves and hose connections must often be accessed at multiple points, and each additional point increases the risk of leaks and spills. These challenges also greatly increase the time it takes for an oil change to be completed, on top of the extra training required for each piece of equipment. Parker’s QuickFit Oil Change System is a three-step process that can help you complete a cleaner and safer oil change in under 30 minutes. The QuickFit valve gives you total control over the process by connecting directly from the vehicle to the final containment location. Used correctly, this can completely eliminate the risk of oil spills and other oil change safety hazards. This ultimately lowers operating costs and increases profitability by saving time, requiring less training and keeping workers safe. The first step in the QuickFit process is to purge the filter. A compressed air supply is attached to the filter purge tool, which is in turn attached to the QuickFit valve. Oil is then pushed through the filter into the engine sump by holding a lever on the filter purge tool for 10 seconds. After disconnecting the filter purge tool, oil is evacuated. 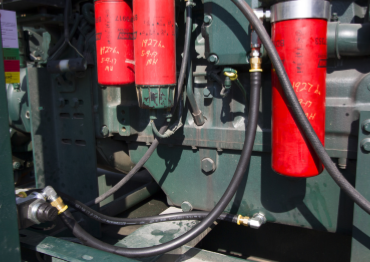 The waste oil hose is connected with a FEM female quick coupler to the QuickFit valve, then oil is removed from the engine sump by turning the waste oil pump on. After this step, the oil filter is replaced. Finally, the engine is refilled with clean oil. 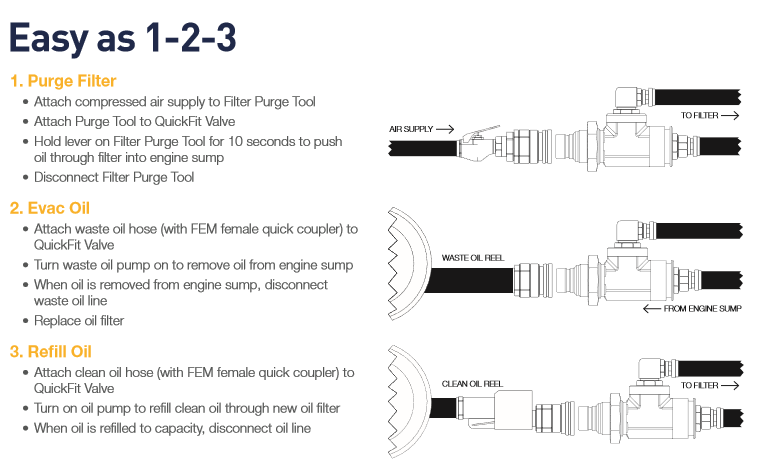 A clean oil hose is connected with a FEM female quick coupler to the QuickFit valve and the oil pump is turned on to refill clean oil through the new oil filter. Once it reaches capacity, the oil line is disconnected. Other accessories are also available, including the Guardian Portable Pump and Filtration System for easy evacuation and refill of clean oil and the Parker Oil Filter Purge Tool, which allows easy connection to a compressed air hose. Oil changes don’t have to be a struggle. Parker’s QuickFit system is faster and more efficient than the typical oil change process, offering a standardized solution for your maintenance headaches. By eliminating spill hazards and reducing workers’ exposure to harmful chemicals, your facility will be cleaner, safer and more productive.